Before this, the only thing I knew of Kyoto is the temple famous for the orange torii gates. Because I knew zilch of this city, you can say I was waiting to be surprised. My education in what used to be Japan’s imperial capital began on our third day in Japan. 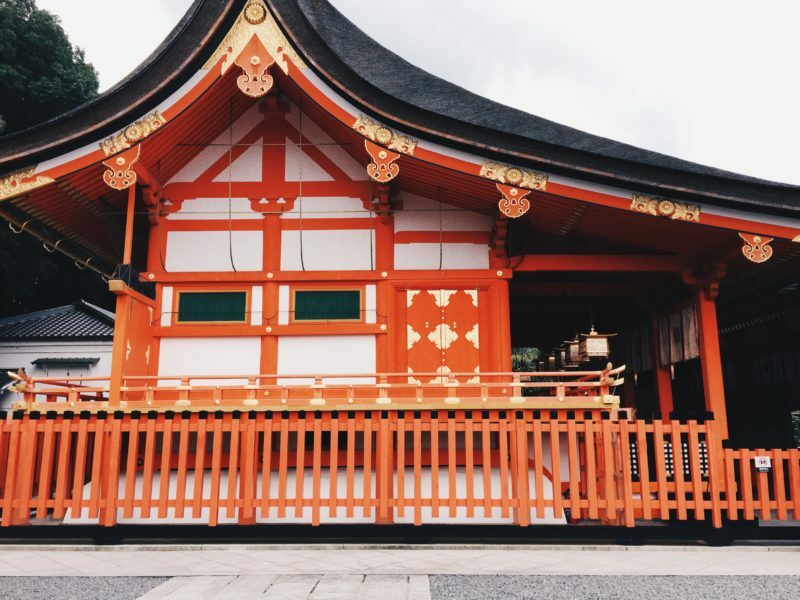 In this post, I will show you the places you can see in a day in Kyoto. How to get to Kyoto? Kyoto is the 7th largest city in Japan in the central part of Honshu island. It used to be the capital city of Japan from year 794 until 1868. Kyoto is now the capital city of Kyoto Prefecture in the Kansai region. 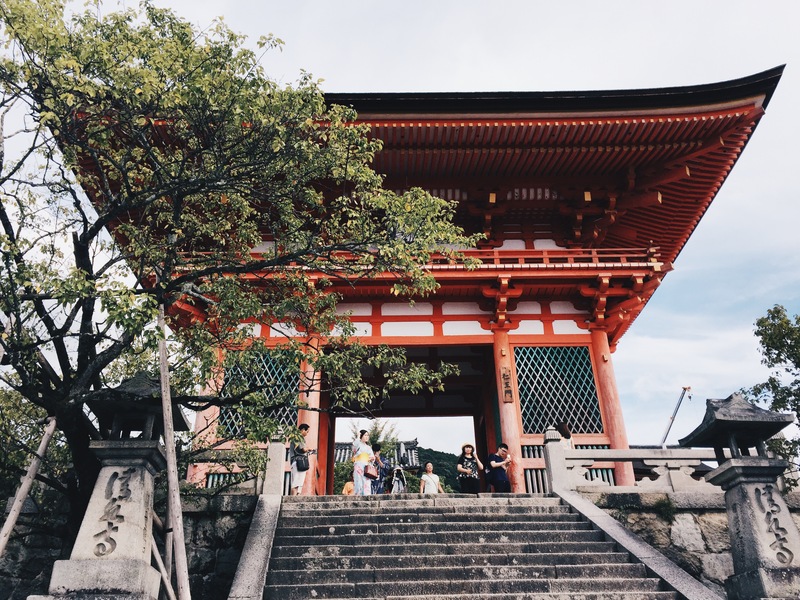 Kyoto is home to thousands of Buddhist temples and Shinto shrines, some of which are free to be explored by tourists. It is also the place where you can find the geisha, or the professional female entertainers trained in music, art, dance, and communication. Although you can find these women in other parts of Japan, Kyoto remains to be the best place to experience the geisha culture. 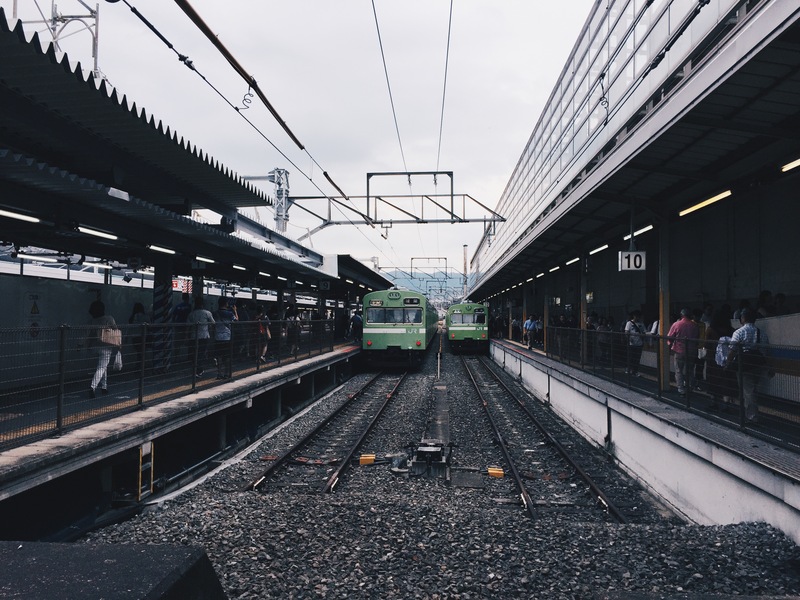 When you touch down Japan you can take the train to go to Kyoto. Travel time depends on which airport you are coming from. Honestly, I was just another sheep in the herd; didn’t pay much attention to our transportation and went along where the others lead. I look at the train system in Japan the same way I look at a rubik’s cube, fascinating but incomprehensible. Apparently, the confusion is not exclusive to tourists; even Japanese people get lost in their own train stations. This is how hiring a tourist guide may serve you well. 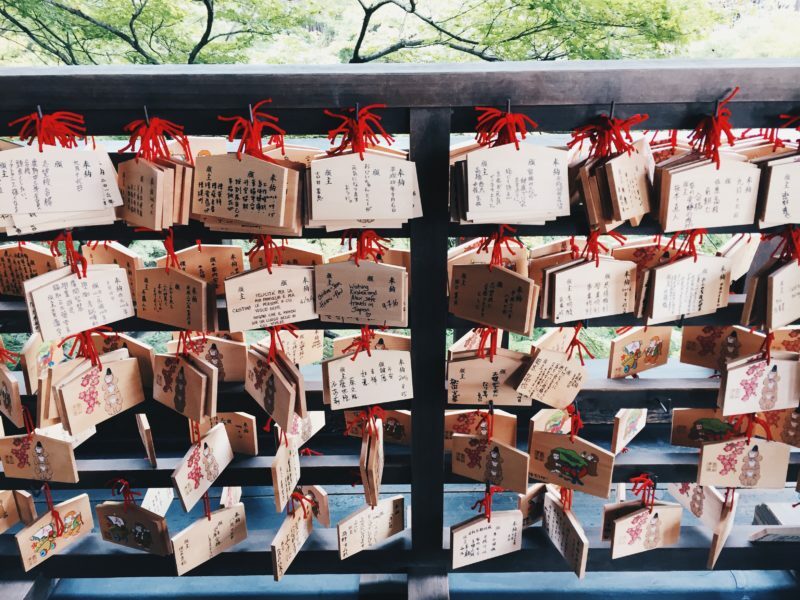 You can go explore Kyoto on your own, but you can also book a tour with a travel agency. Our Kyoto tour was handled by Dragonfly Tours. Our call time was set at 9 in the morning. Our group convened in the lobby of Rihga Royal Hotel where we met with our Japanese guides. I forgot the name of the young slim girl who barely spoke but had a permanent smile on her face. The other, I remember so well because she shares the name of one of my favorite book characters, Midori from Haruki Murakami‘s novel, Norwegian Wood. You can book a trip with Dragonfly Tours here. Some tourists take the trek to Inari mountain, which takes about 2 to 3 hours. Our group didn’t go that far. 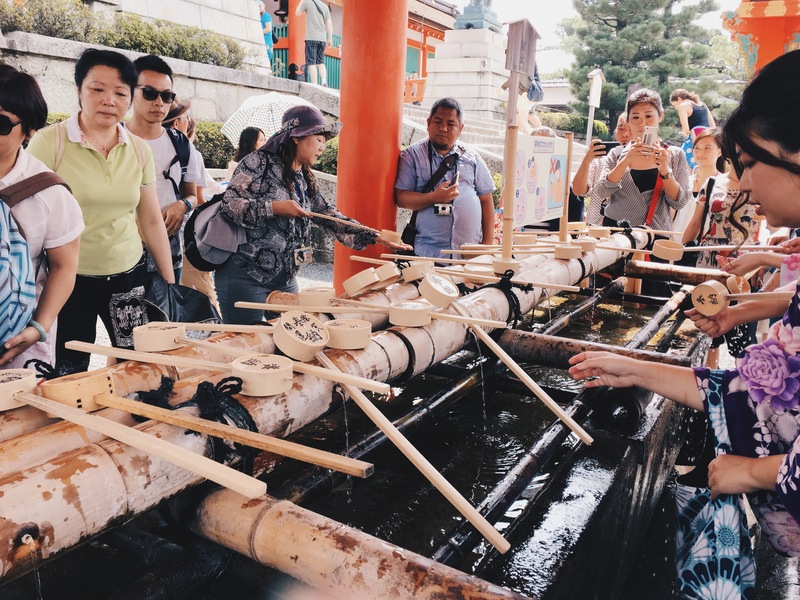 As a sign of respect, stop at the Temizuya to perform Misogi, a Japanese Shinto practice of ritual purification before entering the shrine. 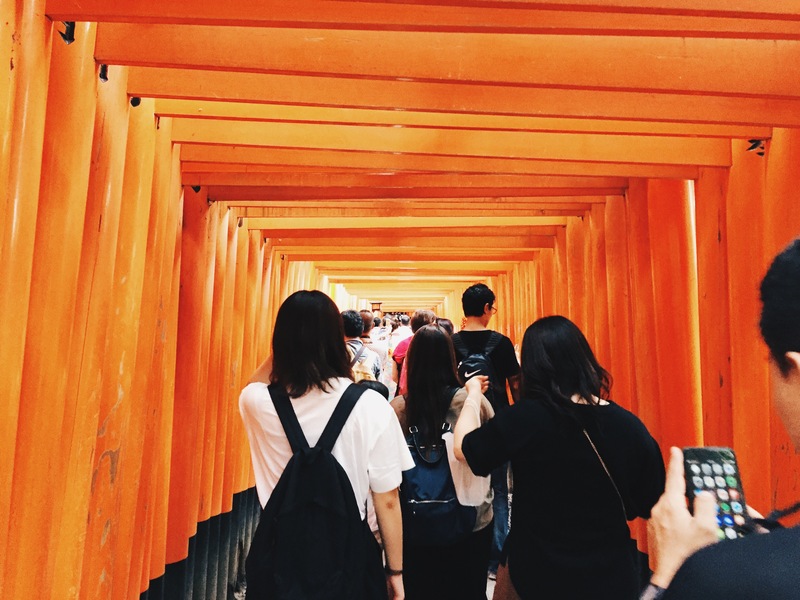 As mentioned before, Fushimi-Inari is well known by the torii gates, which in Shinto, symbolizes the transition from the profane to the sacred. There are thousands of them at Fushimi-Inari and by the entrance stood a giant version of it. Now you’ve probably seen your friends’ photos posing under this orange-colored structures that have become the signature of this shrine. In person, the trails covered by torii do invite a photo session, but we found that this isn’t exactly an easy thing to pull for the reason shown in the image below. The trick is to wait for the people walking ahead of you to get as far as they possibly can so they wouldn’t be seen on the frame then go right up in the middle and make everyone behind you wait. This is how my fellow bloggers took their photos. 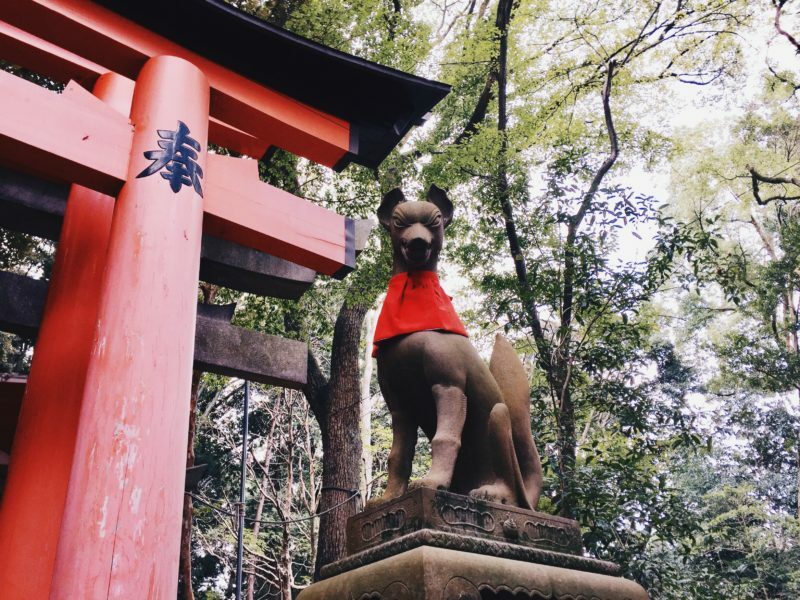 Other points of interest in Fushimi Inari grounds include the Kagura-den, the inner shrine, and the Shin Ike pond. There is no entrance fee at Fushimi Inari. After our lunch at Maruyama restaurant, we hopped on a taxi to get to our next destination, Kiyomizu-dera. We put off on Higashiyama-ku, one of the well preserved historic districts in Kyoto. The street is lined wooden buildings and traditional looking stores. There are cafes, restaurants, and numerous shops that sell various things. Walking along this district is an experience in itself, everywhere you look, you would feel compelled to buy something to eat or something to take home as souvenir. 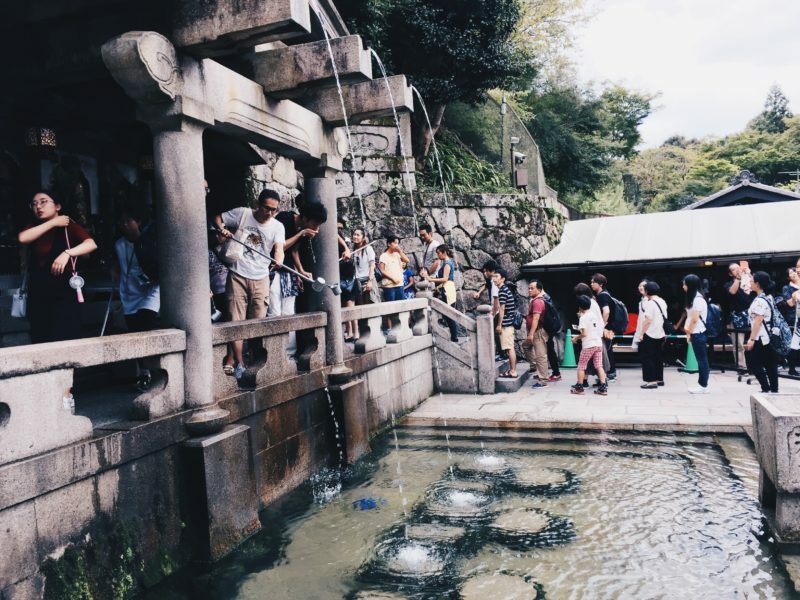 After walking the length of Higashiyama-ku, we reached Kiyomizu-dera (pure water temple). It’s an independent Buddhist temple built in 780 on the site of the Otowa Waterfall in the eastern part of Kyoto. 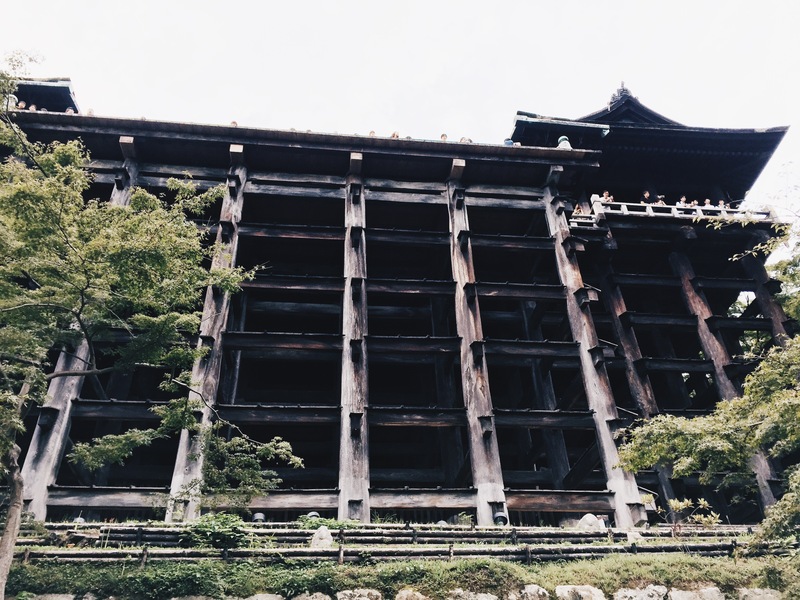 Kiyomizu-dera is one of the Historic Monuments of Ancient Kyoto in UNESCO world heritage sites. Entrance fee to this temple is JPY 300 (PHP 136.30 – USD 2.77). Along the way I spotted some Japanese people donned in traditional outfit. The weather was humid and I noticed that many of them were already sweating. 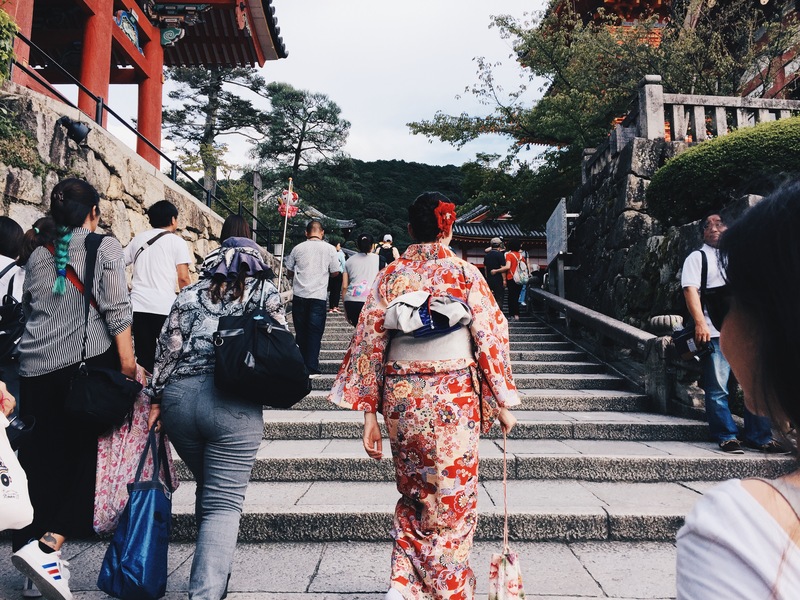 I initially thought there was an event somewhere, then I realized that the Japanese prefer to be in traditional clothing when they visit shrines and temples. I am impressed by their dedication. 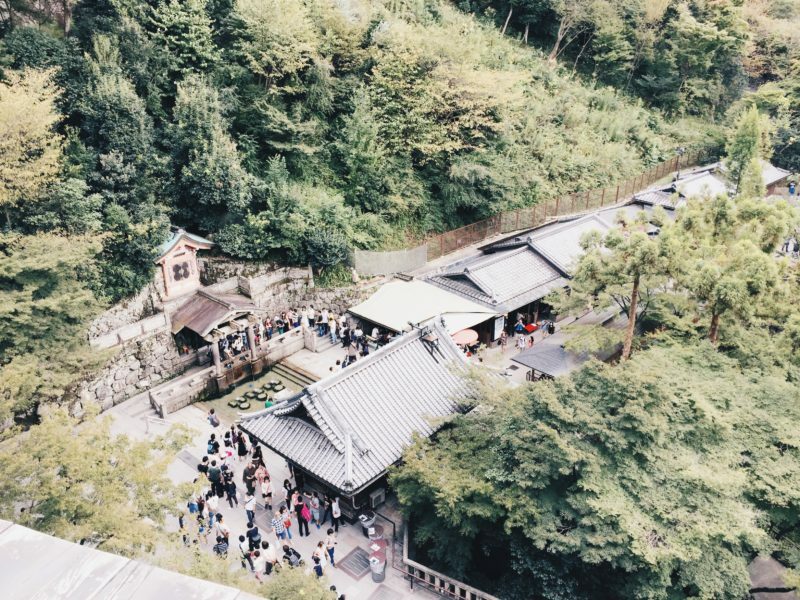 Kiyomizu-dera is known for its wooden stage that juts over the hill. Unfortunately, it’s this feature of the temple that was used by some 200 people who jumped off the stage down to the hill below believing that it would make their wishes come true. Record shows that 34 of these jumpers died from the attempt. I’m not certain about the veracity of the claim, but I highly discourage you from doing the same stunt. I mean can we please just enjoy the view without hurting ourselves? A few people from our group went all the way to Koyasu Pagoda. They say that if you’re pregnant and you reach this pagoda, you will have a safe childbirth. 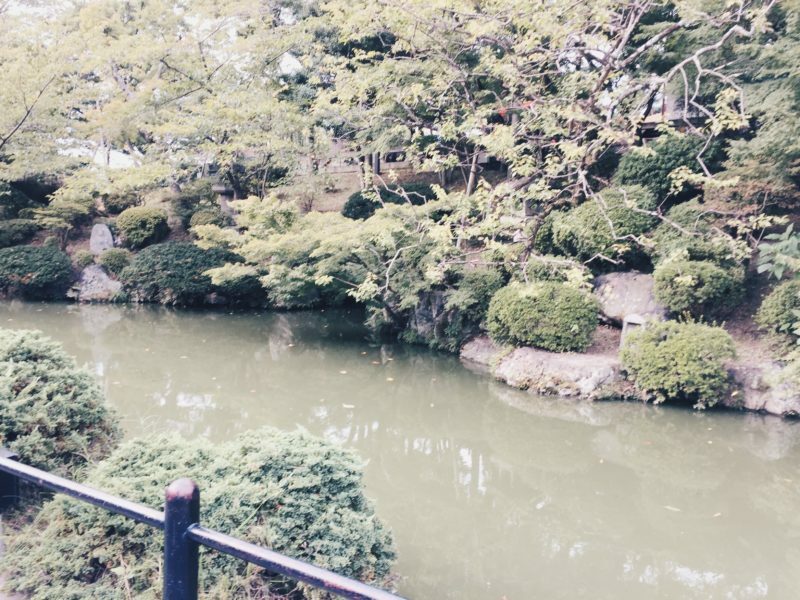 I am not pregnant and the thing that I found more interesting is the Otowa Waterfall. I asked Aleah (Solitary Wanderer) to come with me. Together, we patiently waited in line for an opportunity to drink from the three streams. They say that if you drink from these streams, you will have longevity, find success in school, or find love. Drinking from all streams is deemed greedy though. Kyoto Station‘s futuristic architecture is so striking it can be a considered as a destination of its own. It is designed by Japanese architect, Hara Hiroshi, the same genius behind Umeda Sky Building. Kyoto Station is Kyoto’s transportation hub that caters to Japan Railways, Karasuma Subway Line, and Kintetsu Railways. It also has a terminal for buses that travel long distance. 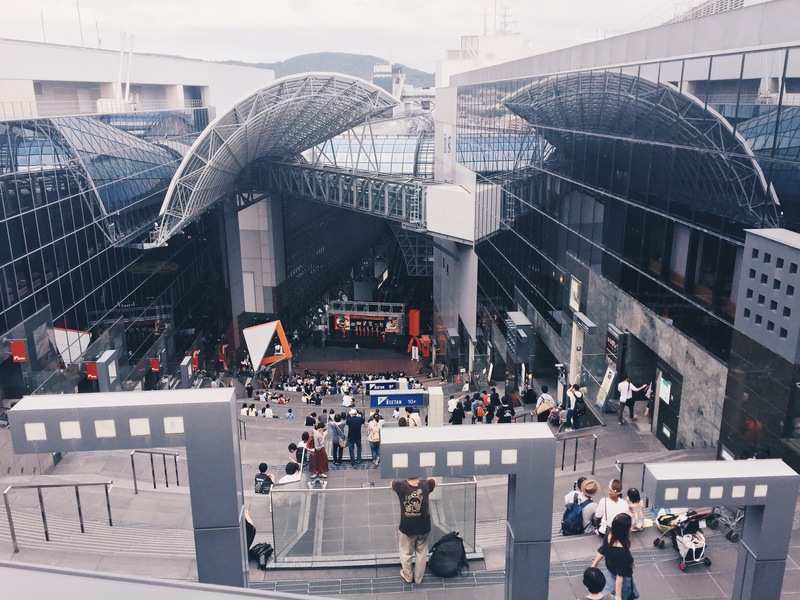 Moreover, the station has malls, a department store, a skywalk tunnel, and an observation deck. I didn’t know it is also considered as an important landmark in the city until my fellow bloggers started taking photos of it. 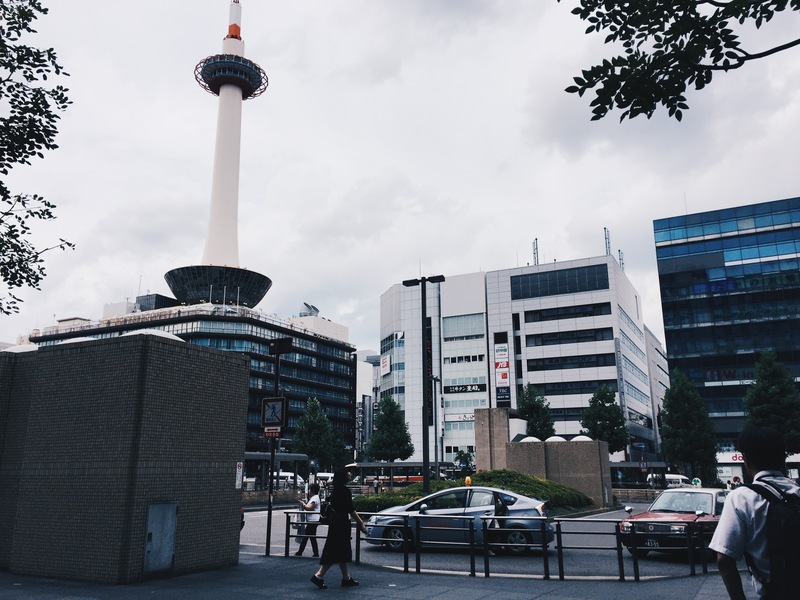 Kyoto Tower stands at 131 meters tall and is the tallest building in the city. You can enjoy a panorama view from the top of the tower, but we didn’t go right in as it was not included in our itinerary. When you go to Fushimi-Inari, try the grilled mochi JPY 500 (PHP 226.51 – USD 4.61). It is the most expensive streetfood I have ever seen, but it got me so curious I asked two of my fellow bloggers, Gael (ThePinaySoloBackpacker) and Jed (Biyaherong Barat) that we share a stick. Luckily, they agreed. 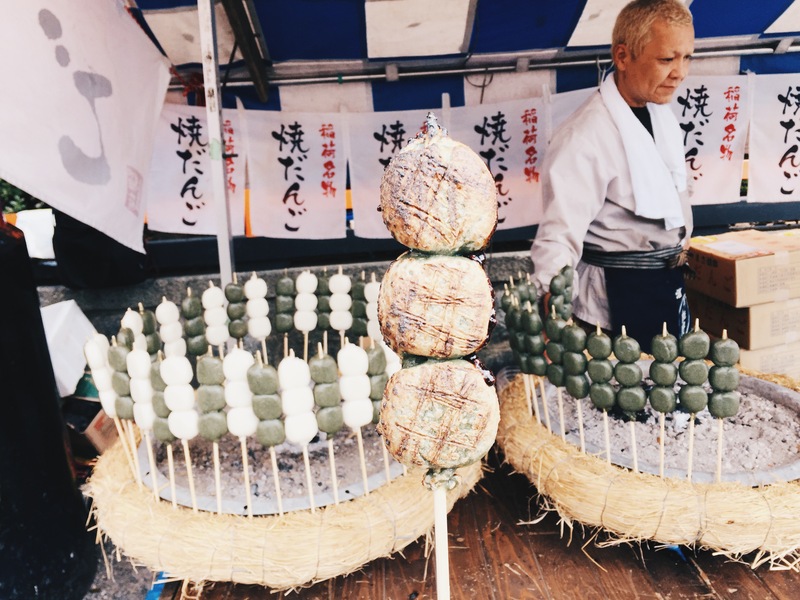 I love mochi but for a streetfood it’s a tad pricey, so if you’re on a budget and you want to try it, do a Marjorie and ask friends to buy it with you. I also recommend the matcha ice cream and this one you can find along Higashiyama-ku. Before this trip, I have avoided matcha like a plague because who wants to eat grass? Definitely not me. But in Japan, they use matcha in a way that would make you understand why there is a matcha craze in the first place. 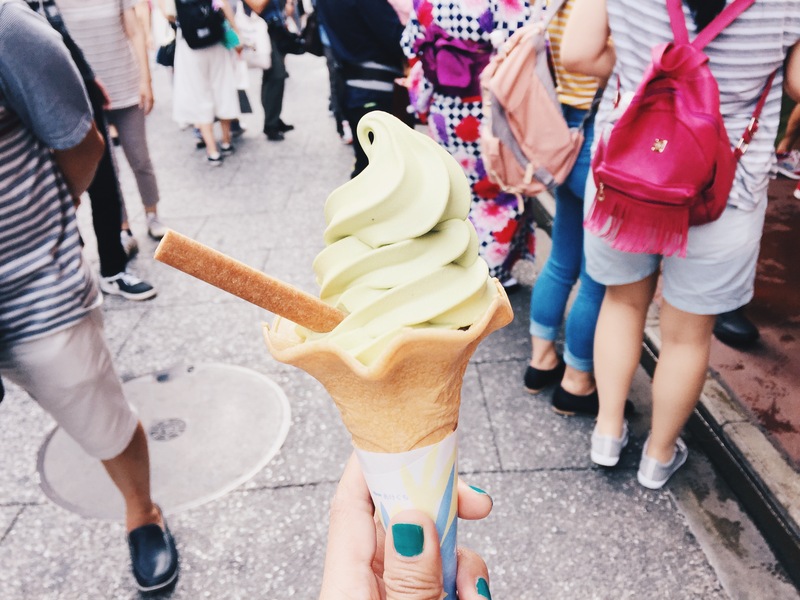 Though the green tea flavor is present, it’s never overpowering, as in the case of this ice cream. I just approached one of the stalls and bought myself a cone. When Midori saw us eating this ice cream, she said that next time, we should try the one from another store, which she claims is where you can find the best matcha ice cream. I thought the one that I was eating was delicious, but it turns out it wasn’t the best? Makes me wonder how the more popular matcha ice cream tastes like. Cebu Pacific flies between Manila and Osaka five times weekly, with lowest year-round fares starting from PHP6,399. Cebu Pacific also flies from Manila to Tokyo (Narita), Nagoya and Fukuoka, as well as from Cebu to Tokyo (Narita). Book its trademark lowest fares now through CEBsakaflights or (+632)7020888, or follow its Facebook or Twitter pages for the latest seat sales. Disclaimer: This Osaka fam trip was courtesy of Cebu Pacific. Photos, review, and opinions are my own. My facination for Japan had been Mt. Fuji and Cherry Blossoms. In fact when I came across your site, with Japan as a section in it, I was hoping to find it. 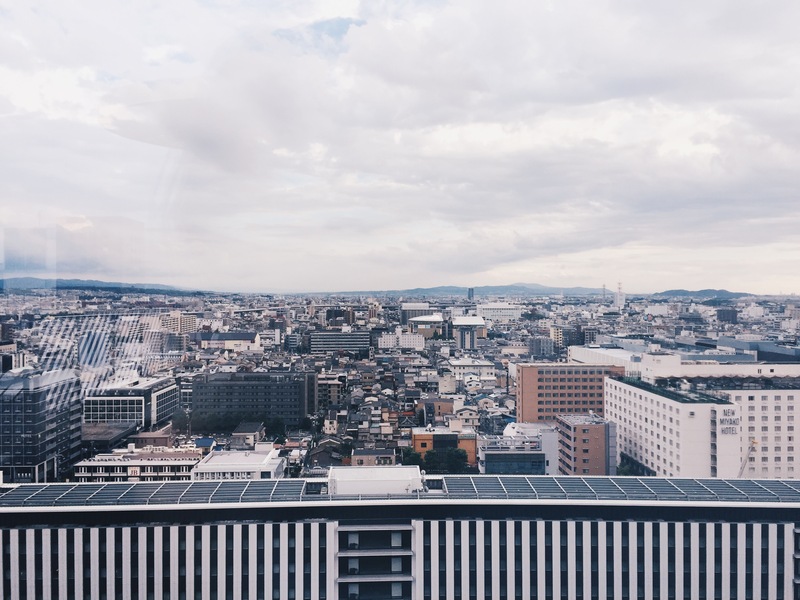 But I am glad to have read your blogs on Japan and it broadened my perspective about it. I would definitely look forward to including Kyoto during my visit to Japan. Kyoto has always been far from my dream locations since it’s too far from Tokyo and transpo will definitely be more expensive. But as you said, the Fushimi Inari is the only thing I know of that destination. Hi Elisa, matcha is green tea so that’s how it tastes, like a bitter tea with a bit of a chalky texture to it. I wasn’t aware of the outstanding beauty of Kyoto! You captured all important thing there are to be seen there, Marjorie! Great post, and lovely images. I really want to go here and visit for a week! It’s on my bucket list. The ice cream looks pretty awesome. What’s your favorite part of the trip? 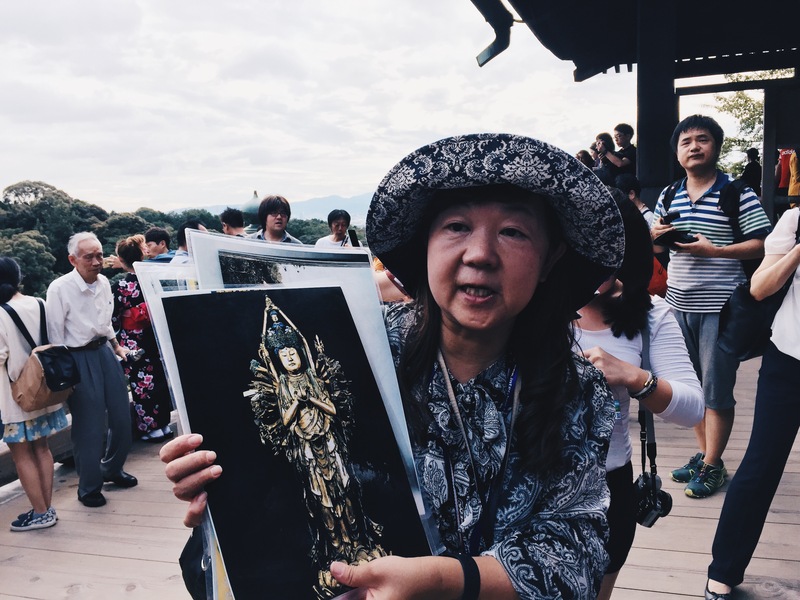 There are a lot of things that you can see in Kyoto. Were you able to see their fireworks at night? It is a lovely sight. There is also a persona called “Miko” or shrine priestess and their performances at their respective temples are really a sight to see. Were you able to see one? You must have been pretty tired after all that! Kyoto was my favourite city in Japan; it’s a gorgeous city but very busy in the main tourist areas. This is absolutely a great-written travel guide when in Japan particularly in Kyoto. The culture, the place, the food as well as the preserved-historic houses and architechural buodings are worth to try. 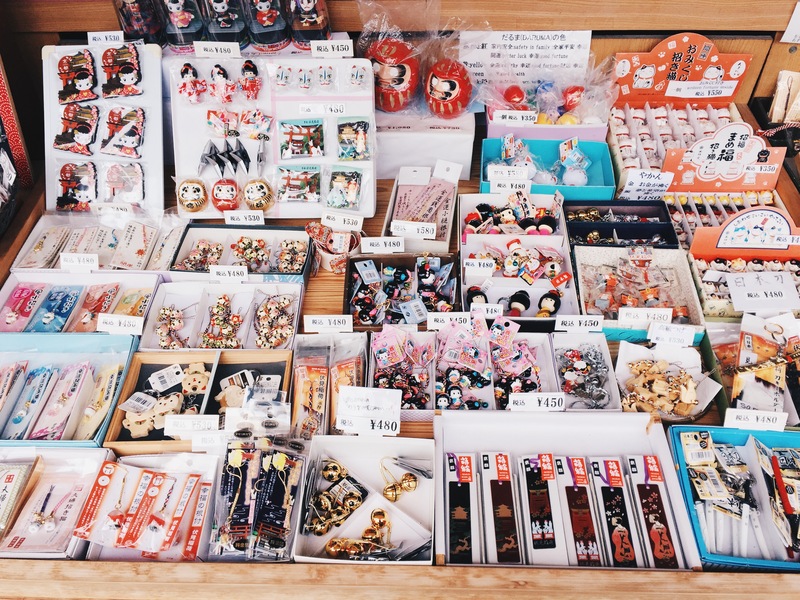 I’m planning to go to Japan mid next year so this article helps a lot in my planning. This excites me exploring Japan. Great post!!! Will definitely bookmark this for nect year since my friends and I are planning a trip to Japan. We’ll try to stop by Kyoto since it looks lovely and hward a lot of great things! 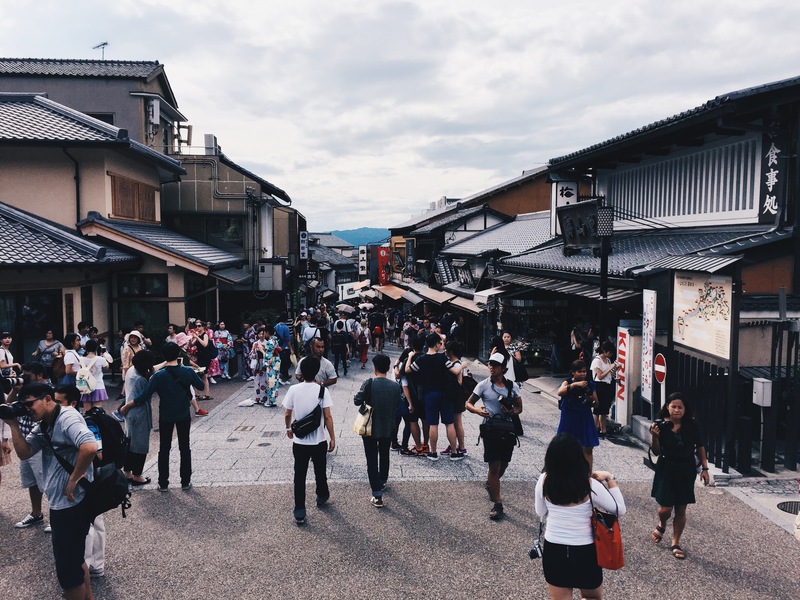 Kyoto looks like an overwhelming destination with so much to cover in one day. 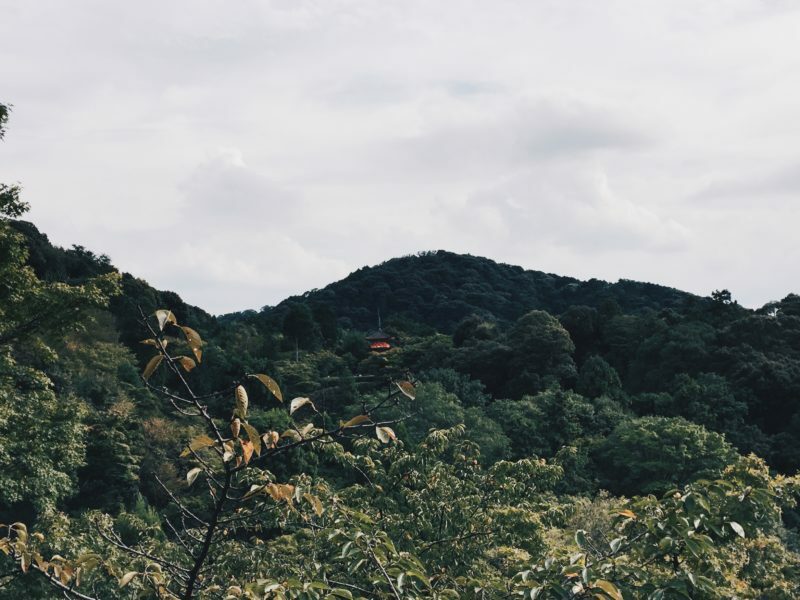 I loved the way you have included all important details about visiting Kyoto in your post. I m bookmarking this article for later use. A nice post with lot to cover in a day….That griiled mochi is gaining my attention though a bit costly but I am would have for sure tasted good..